Home » Blog » It’s Almost Christmas Giveaway! We are having another amazing christmas giveaway. 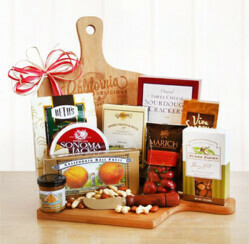 You can be the lucky winner to receive this Gourmet Cutting Board Gift Set set by CaliforniaDelicious.com. Send thoughts of warm California breezes, golden oaks and lazy afternoons with this very special California Delicious wood cutting board gift. Enjoy creamy Sonoma Jacks cheese, Three Cheese sourdough crackers, Nunes Farms roasted fancy nuts, Napa Valley hot and sweet mustard, chocolate chip cookies, California dried fruits and nuts, Marich chocolate covered cherries, Viva Sonoma biscotti and California Rail fruit candies. All this plus a wood handle cheese knife make your California picnic complete. 1. Share the contest on Twitter. 2. Go to ChristmasGifts.com and choose a product you like. 3. Scroll down to the comment box under the product. 5. Type in your answer to this question in the comment box: What is your favorite Christmas Gift on Christmasgifts.com and why? I like the word art coffee mug because it’s super fun! Shared on twitter and commented on fb! Whoever wins is very lucky 🙂 Merry Christmas! The Godiva chocolate gift basket is awesome. I would love it because Godiva makes the best chocolates. This offering is my favorite and I would be so happy to win it. After visiting the ChristmasGifts.com website, my favorite Christmas gift would be the Capresso Coffee Team TS. The reason this is my favorite is because my husband LOVES coffee, and this would be the perfect gift for him. He would love the cup settings and strength settings. He is a truck driver, so he always ends up making a big pot of coffee so he can take it with him when he drives. My favorite item after exploring the site is the Ornament Storage boxes! It would definitely help by making sure ornaments won’t break. I would definately choose the Dinner Gift Of The Month Club. I would love to give this to my dad. I know he would love it because he loves trying a variety of different foods. I love the fruit basket! Very nice. My favorite is the Word Art Coffee Mug because I love clear coffee mugs. No question, Cheese of the Month Club. Why? Hello it’s cheese. My favorite is the Fruit Basket because everyone loves fruit and it’s sure to please anyone. Godiva® Chocolate Gift Basket because I am a total chocolate addict!! my favorite is the pizza gift. You can’t go wrong with pizza. I shared on twitter. I would love any gift basket that you have!! Love love love gift baskets! Thank you for the contest! Dinner gift of the month. I really love the idea of this . it’s different and fun to look forward to! I love the fruit basket – Yummy! My favorite is the Dinner Gift Of The Month Club because almost anyone would enjoy this! I love this Starbucks Fireside Holiday Gift because I love Starbucks!! I would love the Gourmet Cheese of the Month Club. I love cheese, there are always several types of it in my fridge on a regular basis. Who wouldn’t love to get to NY style pizzas delivered fresh to them every month! What a mouth watering gift. At Christmasgifts.com I just LOVE Godiva® Chocolate Gift Basket! What can I say… I just love chocolate! Especially Godiva Chocolate! I like the fruit gift basket, i need to eat healthy!! Personalized World Traveler’s Map is my favorite because it is unique. My mother collects frogs and I have never seen this one before. I have to get her the Contented Yoga Frog Garden Sculpture. I love the Bath and Body Gift Of The Month Club! I’d love that! Definitely the Executive Gift Basket!!!!! It would have to be the Godiva® Chocolate Gift Basket. I love chocolate and especially Godiva. The exclusive gift basket is my fave. I can’t believe how much stuff they pack into it.